2019 E63S Sedan Sailing. Anybody Else? For those who are saying that Dealers knew ahead of time of this VPC delays is just not true. This is an email sent by MBUSA CEO 12 days ago and he explains very clear the reasons for delay. What might the mentioned incentives, in the middle of the letter, breakdown to for customers waiting 9+ months for a vehicle? Guys—E300s added to the list today! Thanks. But any word on the release of cars that have arrived? As of today status , worst case scenario is Mid October. For those who remember the wait of to 2018's in 2017, is dej'vu now . Same story. Interesting. Assuming the 53 is held up due to the new engine. Do you think they would release the 63 before the 53, or wait to release them together? No. Those are part of the August program. I may expect something special for customers who ordered 2019's and now they have to wait 3-4 months after VPC. In 2017 the MY18E63 and MY18 GTR owners got two free services. Last edited by Wassaby; 08-13-2018 at 04:01 PM. Hmm, this has really taken the joy out of this process. You are supposed to enjoy ordering a car and this is turning into a nightmare. Just so you know is not just MB who was this issues and is more than EPA related..unfortunately politics has some % of fault. Will this be something we will need to push for? Or automatic from MBUSA? Great, makes sense but no comfort to me. Really not sure what to do, I can’t accept a delay into 2019, especially if they end up facelifing it, which would just rub salt into the wounds!! E63 facelift is due for 2021. In a very sad way, that makes me feel a wee bit better! Thanks! So, a long conversation with my dealer! He is bemused as me as to the order process and MRP system that Mercedes use! He sent in the correct spec and got sent an incorrect build back initially. Mercedes source parts from across different suppliers, wheels for example come from an Italian supplier. When there is a shortage the system puts in the closest alternative to fill the build which was what happened with the incorrect wheels on my initial build. Then when I requested the correct spec, the shortage on wheels came up and I was moved from that build or ‘decade’ as MB calls it and moved to Oct Decade 2 (there are 3 builds per month). When this was moved, the wheels were ok but there was then a shortage on HUD! They now cannot guarantee when this shortage willl be sorted but believe at some point over the next few weeks/months it will be ok! I said this is a total nonsense and what was I supposed to do? Have an open ended supply date? We have now agreed that there is a ‘freeze’ date in the MRP system where builds cannot be changed and my one is 5th September. If it’s not sorted by then, he will cancel the order and refund my money. This is honestly the poorest and most disappointing car purchase process I have ever experienced. I don't know if that's a new policy they're enacting due to constant supply constraints or I was a fluke. I think my car was waiting on 3-4 different parts over the course of a couple months and instead of doing a substitution they just kept postponing it until they had everything to build it. During the 6 months a factory rep told my sales manager that the dual screens, the HUD, and the ceramic discs were all on backorder at one point or another. This is what I am wondering, it’s the lack of certainty from the dealer which makes me nervous. I asked him, ok, so we get to September, the HUD still isn’t in supply, what happens? Do I get moved to say Nov Build? He just didn’t know! Is that really how the system works?! When my options were not available, it just knocked me to a later allocation. Otherwise, the entire build can get changed pretty radically, no? For example, what if you wanted performance seats and the driver assistance pack? If the seats were in shortage, would the system just kick it back to regular seats and then invalidate the assistance pack for performance seats and not add the regular assistance pack?! I wouldn’t be surprised at all. I’ve asked a load of questions about that happens in various situations so awaiting a response. He has also told me to write to the head of Mercedes U.K. to complain! Could you let me know how you found out about the this list of vehicles being approved for delivery? My SA (Heartland Mississauga) still wont release my GLC Coupe from Halifax. 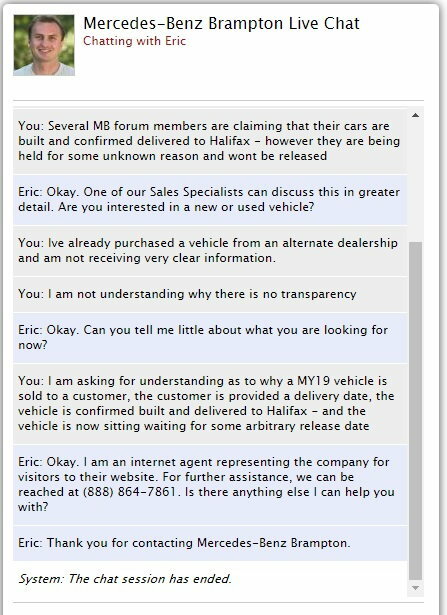 I tried engaging the online sales rep at MB Brampton and Eric didnt seem to want to talk about it haha. those online sales rep (if you think they are actually sales rep which they are not) does not know a thing at all. They are just taking down your request (like if you are looking for pricing info), they will have an actual sales rep getting back to you in about 24 hours time. Do you know how much you're paying for the GLC Coupe? Has your SA informed you of the price? My initial order was placed for a MY18 GLC Coupe with the Night Package. Order was placed in March. A few weeks later he called and told me that the Night Package could no longer be added to MY18 since Germany has restricted it stating that all of the components were allocated for MY19. So I went ahead and allowed the switch to MY19. His words were that the pricing will be virtually identical - give or take a few hundred bucks but it would only be confirmed once the car shows up. I told him that I now expect him to do something on the price because of all of this delay and back and forth, Again he says he will - but cant do anything until the car physically arrives. But his claim is that the delay is solely a result of the Canadian Government Regulations hold. Hence my query of how you found out that the MY19 GLC Coupe is released for delivery by the Government? If I have some hard evidence - well lets just say I will be going over his head. Im not really concerned about pricing - more when I can get my FREKIN CAR!! haha... This is my first MB and quite a step up from my previous vehicles so the wait is killing me. I asked if she could email me confirmation of this - she said since this is anticipated approval dates - they will not put anything in writing. Looks like you will prob get your car at the beginning or Mid September. As of now, it seems to be going all according to that post of the pic from MBUSA someone posted a few days ago. Quick Reply: 2019 E63S Sedan Sailing. Anybody Else?